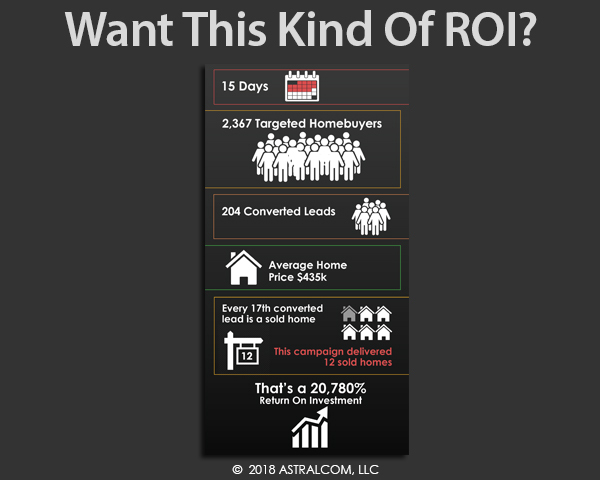 The Proof is in the Conversions – Marketing for Homebuilders | ASTRALCOM - Content Strategy, Conversion Marketing and Customer Acquisition. The Proof is in the Conversions – Marketing for Homebuilders | ASTRALCOM – Content Strategy, Conversion Marketing and Customer Acquisition. If you want better ROI from your digital marketing efforts, then you’ve definitely come to the right agency. For more than 20 years, we’ve been helping homebuilders connect with homebuyers in the most successful ways. Curious about how we deliver such outstanding lead results and ROI? These links contain 20+ years worth of knowledge, dozens of successful client outcome examples and proven digital marketing practices that you can leverage in your efforts to sell more new homes. Or, you can contact the homebuilder marketing professionals at ASTRALCOM to get you up-and-running right now, with inspiring messaging, targeted advertising and multichannel marketing that sings to homebuyers – and lifts your bottom line.